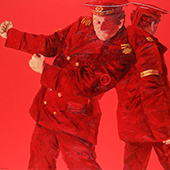 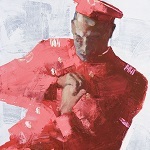 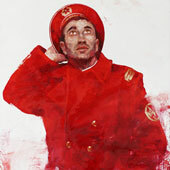 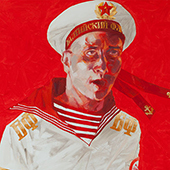 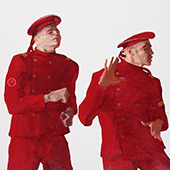 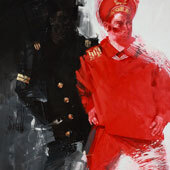 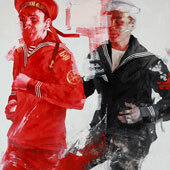 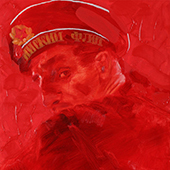 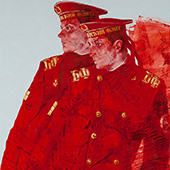 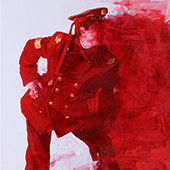 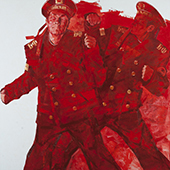 The oil series Red Sailors by Alexander Zhernokluev combines the academic traditions of the Russian realistic school and the decorative ideas shaped by Modernism. 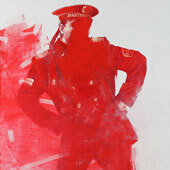 Zernokluev has placed monumental figures of heavy texture on purely white surface of the canvas. 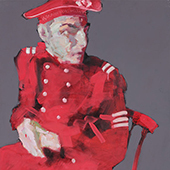 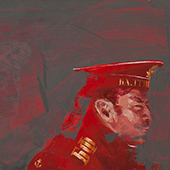 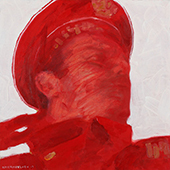 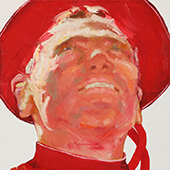 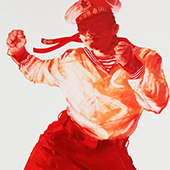 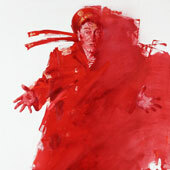 Relying on the emotional strength of two colours – red and white – the artist achieves bright, almost traumatic visual effect. 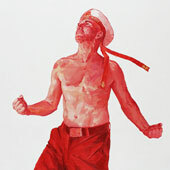 The disturbing, vexatious red brings the idea of high energy, passion and joy. 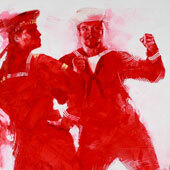 The white of the background combined with the golden elements of Navy insignia on their uniforms make the dancing Sailors the embordiment of triumth. 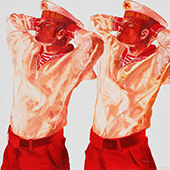 The Sailors, who are swaggering, fooling around, experiencing euphoria or falling in thought, do not tend to control their emotions, and they seem to become the symbols of those emotions reflected against the bare sterility of the background. 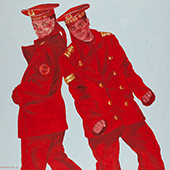 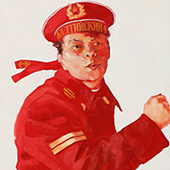 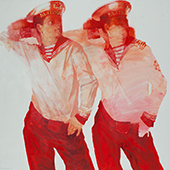 Despite their modernistic look, the images remain truly realistic figures, typical of the Russian painting traditions. 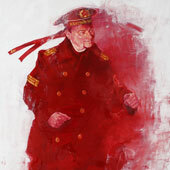 Alexander Zhernokluev used to serve in the Navy himself, in the Baltic Fleet. 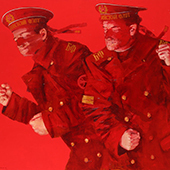 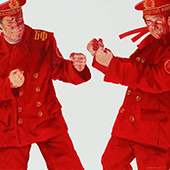 At that time, military duty was obligatory for all Soviet young men. 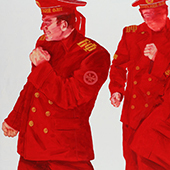 Three years, the age of 18 to 21, which is a time of folly and daring boldness, were spent under strict discipline and obedience to authority. 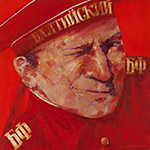 After that, Zhernokluev moved over to art. 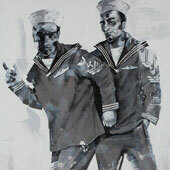 Some grotesque images of sailors could already be found in his early works. 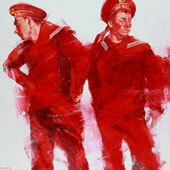 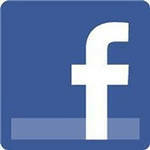 Later, they developed into red, high-spirited guys, who are now a kind of the artist's 'trademark'.